Let's continue to bask in that feeling of anticipation. Jesus is coming. How did people before His time know the Messiah was coming? The Savior was prophesied even in the Old Testament. "For to us a child is born, to us a son is given, and the government will be on his shoulders. And he will be called Wonderful Counselor, Mighty God, Everlasting Father, Prince of Peace." Isaiah 9:6. Where do we always start when studying a verse like this? Context. Isaiah has one of those unfortunate callings of continuously reminding God's people of their impending judgement. "If you do not turn back to the Lord, you will find yourself in exile." That's God's message through Isaiah again and again. One in a while, however, Isaiah gets to deliver good news: "Long after you have been exiled and then once again been restored as a nation, the Messiah will come." Hope and forgiveness is on the way. Isaiah 9:6 is one of those glimpses of light to the people of God. Help is coming! Jesus was born into this world as a baby, the Son of God. This may have become so commonplace to us that we forget to marvel at what it means. Philippians 2:7 says about Jesus: "He made himself nothing by taking the very nature of a servant, being made in human likeness." We have a God who was willing to humble Himself enough to be presented to this world in the form of a baby, a fully human baby. He came in this vulnerable state, was raised like any other human boy of His time, and experienced human pain and temptation. He is also the Son of God, fully divine. It is a wonder beyond our human understanding. Jesus is God Himself coming to this earth to serve us, His creation, by showing us how to live and ultimately dying for our sins. Wow, let's let that miracle of Christmas sink in. A God who loves His creation enough to make huge sacrifices on their behalf! What's Isaiah saying about the government? It will be on His shoulders? Do you see why the disciples expected Jesus to overthrow the government and reign in its stead during His time on earth? They expected a different kind of Savior. However, while the people of God were led like a nation in the Old Testament, now, after Jesus' life, death, and resurrection, the people of God are the Church. He reigns in our lives in a different sense. Quick note: This is a text that premillennialists may use to support their belief in a literal 1,000 year reign of Christ at the time of His second coming. Many believers would subscribe to the belief that when Jesus returns, He will govern this world in the same sense in that human governments govern over the earth right now. Now it's your turn to dive into the text during your personal time with God. Subscribe here to download your free Bible study worksheet to study these four names given to Jesus in Isaiah 9:6 - Wonderful Counselor, Mighty God, Everlasting Father, Prince of Peace. I'll point you to some free Bible commentaries available online to help you learn more about these four names of Jesus and, of course, turn that newfound knowledge into worship. We don't just study for head knowledge, after all. We want Scripture to move our hearts to worship and obey. Click on the image to sign up for an instant download and a powerful quiet time study guide. 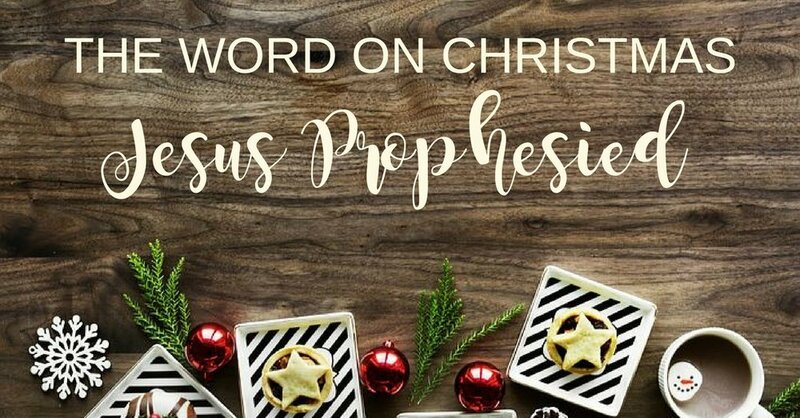 Come back next week for week three of the "The Word on Christmas" series when we look at how Luke builds anticipation for the birth of Christ.